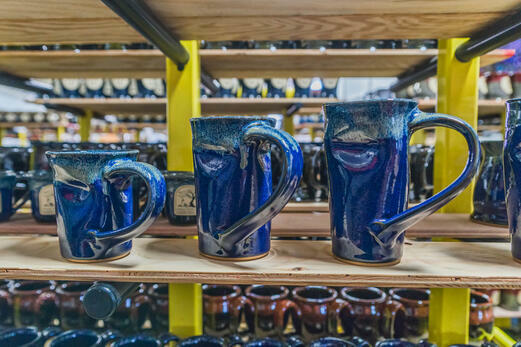 The potters at Sunset Hill Stoneware turn and burn hundreds of unique coffee mugs each day. With military precision, our team is able to keep our whole operation running so you have the highest-quality unique mugs available. 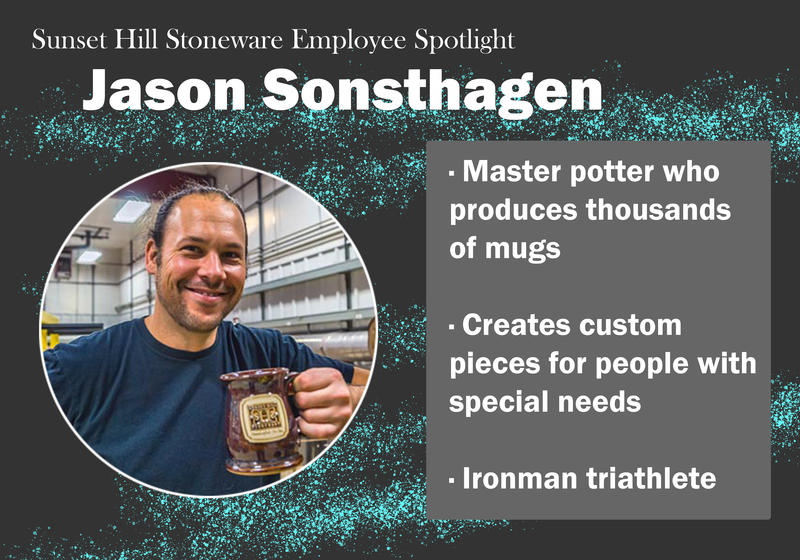 Meet the man behind the whole operation at our pottery facility, Jason Sonsthagen. The production manager at Sunset Hill Stonware, Jason has been working with us for nearly 20 years, since he was a young man barely out of high school. His expertise extends far beyond his ability to make our unique mugs, and he uses that to his advantage when he makes our products from a humble lump of clay. As our production manager, Jason oversees all of the unique coffee mugs, beer steins and other stoneware products we make in our shop. He also trains our potters and handle and medallion assemblers on how to do their jobs, and experiments in glaze chemistry to make our newest glaze colors possible. Far more than a jack of all trades, Jason is a master of his craft. 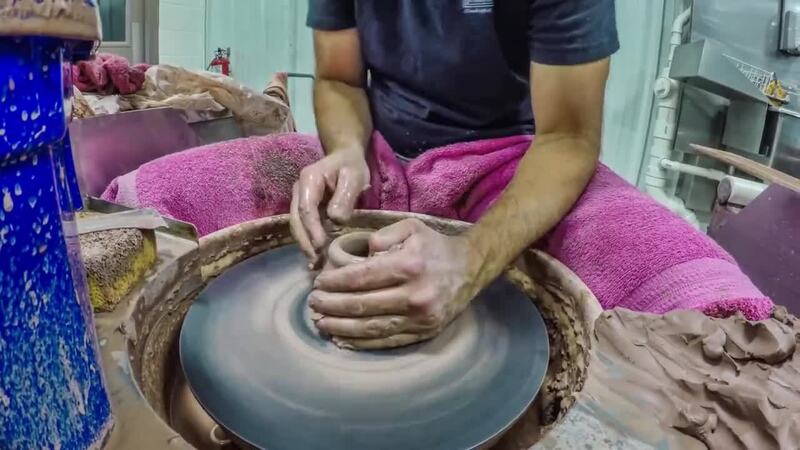 Jason has been throwing pottery since he was a student at Appleton East High School, located in the nearby town of Appleton. 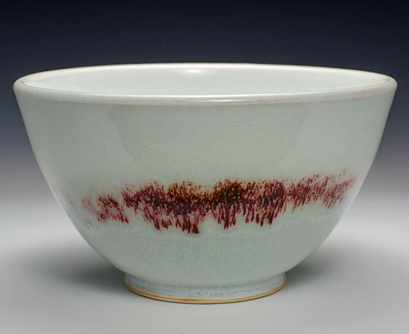 Originally, he discovered wheel-thrown pottery thanks to his teacher, who instilled a passion for ceramics in him early in his high school years. All in all though, Jason does not consider the route he took to get to Sunset Hill Stoneware to be typical for most potters. It's more common for potters to discover their passion for throwing in college, or even later in some cases. However, seeing how interested Jason was in learning the craft, his high school teacher took him under his wing. "I was really fortunate to learn the basics and fundamentals of throwing from my high school teacher," Jason explained. "Typically, most people don't get that." At his teacher's recommendation, Jason applied to work at Sunset Hill Stoneware right out of high school. Aside from a brief sabbatical away from the company early in his career, he has been working in our pottery facility throughout his adult life and has trained several other artisan potters in turn. Before becoming a professional in his own right though, he learned from other Sunset Hill potters before him and used his experiences there as a reference wherever he went. "I really enjoyed it, and I really liked making the mugs that the guys made," Jason said. "I kind of always used that as a comparison. Wherever I was, I didn't enjoy it as much as I did at Sunset Hill. I didn't have as much fun doing what I was doing." Famously, health issues that often go hand-in-hand with the job are one of the biggest drawbacks involved in pottery. Most potters have to wear dust masks while they're working, and the facilities they work in are damp, dusty or sometimes both. Whether or not they actually wear their masks on the job, however, remains to be seen. "There's not many potteries out there that I would want to work at," Jason admitted, laughing. Sunset Hill Stoneware doesn't call itself America's Cleanest Greenest Pottery for nothing. Because of our unique ventilation systems and dedication to cleanliness, Jason feels well enough at the end of the day to go for runs—he is, after all, a triathlete who has completed the Ironman Triathlon and still runs in his spare time. Potters at other companies aren't often able to run after they come home for the day. "Here, it's nice. I come in every day knowing I can do what I love and I'm healthy and safe," Jason said. "At other places, unfortunately, people are not as lucky to have what we have and you have to wear a respirator half the time, or you should." Jason makes far more than just mugs for us. Some of his most recent examples of his diverse body of work include vases, customized ceramic trophies, mugs that are two feet tall and more for some of our clients and closest friends. While it's second nature for him and the rest of our team to "turn and burn" some of our most popular mug styles, these unique pottery pieces are works of art that provide an additional challenge for his creativity. In his spare time, Jason takes his passion for pottery even further by teaching budding young potters how to throw. He also has his own studio outside Sunset Hill Stoneware, wherein he creates designs outside the realm of his unique coffee mugs and beer steins, including porcelain bowls, ornamental lights and other products. His work through High Cliff Studio can be seen on his Instagram page. Jason is a self-described geek for functionality. While he still enjoys creating vases, sculptures and other works of art whose purposes are purely aesthetic, he loves seeing people using the mugs he makes and creating pieces with functionality in mind. Aside from creating the mug shapes from Sunset Hill Stoneware that everyone knows and loves, Jason made an even more unique coffee mug as an act of kindness for a member of our community. Jenny Schmoock, who manages one of our area gas stations, was born with a genetic condition called ectrodactyly. A rare birth defect, ectrodactyly causes the hands or feet to develop improperly in the womb, often resulting in fused or missing fingers at birth. Due to her unique condition, Jenny had spent much of her life unable to hold cups, mugs and other small objects with one hand—an ability most people don't even have to think about when they drink their coffee or tea. Previously, one of the only ways she could drink one-handed was using a soda can she could crush into the shape she needed to get a proper grip. Jason, having heard Jenny's story through connections in our tight-knit community, decided to work with her to bring her something she had never been able to use until that point. Basing the shape off a soda can she'd crushed for him, Jason made Jenny customized mugs that she could use with one hand. While it was a process of trial and error to position the handle in a way that allowed her to grip the mug comfortably, Jason was able to create a set of customized stoneware mugs made just for her. Jenny's daughter Grace, who is in elementary school, also got stoneware of her very own. Being different as a kid is hard enough without having a very visible condition like ectrodactyly, so Jason took to the wheel once again to create a customized stoneware cup for Grace so she could drink from her own Pink Passion big-girl cup using only one hand if she wanted to. The design is custom-made to fit to her hand—Jenny can't hold it the same way she can. Jason's designs for Jenny and Grace have been life-changing for both of them. Not only are they able to enjoy their coffee, milk and other beverages one-handed like most people and not worry about spilling, but they're also able to enjoy something that wasn't as accessible to them before. Jason has made several more pieces for the Schmoocks to use, along with outfitting some of Jenny's mugs with special silicone lids so she can have customized travel mugs. He plans to help Jenny as she needs him in the future, particularly as her daughter continues to grow up and get bigger. While he isn't the only potter who works at our shop, Jason is a master artisan whose knowledge has been a game-changer for Sunset Hill Stoneware. We look forward to seeing what he'll do next and how we can bring it to your door in the future.